As we move rapidly into the holiday season we have some great news to share from our African partners. In spite of many obstacles and hindrances during the year, they have all persisted and God continues to bless and increase their ministries. Christmas will be a busy time for all of them and we have prayed a lot about how best to bless them and show them our love at this special season. 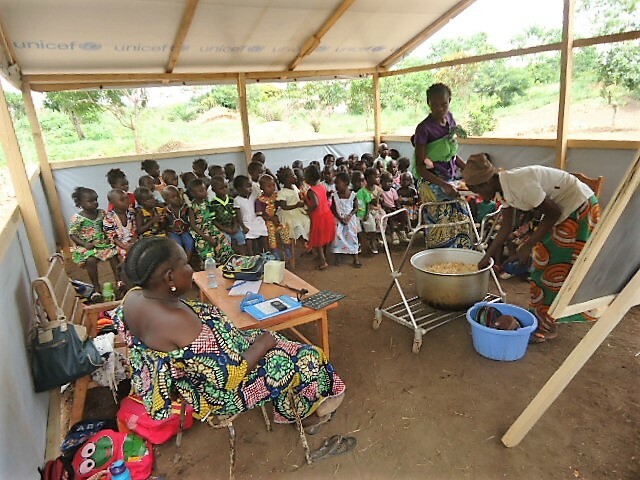 With continued instability in some of the countries, we feel it best to send funds so that our partners can buy small gifts and plan a special meal to celebrate with their family and team partners, and with the children they minister to. If you would like to contribute, please send us donations as soon as possible – although any later donations will of course be forwarded to them as usual as needs are always ongoing! We encourage you to send cards or notes to them, and will give you their contact info upon request. We also have a page we can send you with recent photos of the staff and individual orphans at the Joseph Project (14 orphans and the 6 “orphan friends” who do not live at the JP but are local village orphans who attend the church at the JP and participate in most of the activities, including receiving help for schooling). As we celebrate Thanksgiving here, we truly thank and praise God for each and every one of you who help make this ministry possible and enable so many people of all ages to learn of God in lands far away! Happy Thanksgiving! Love from Gerald and Shirley. 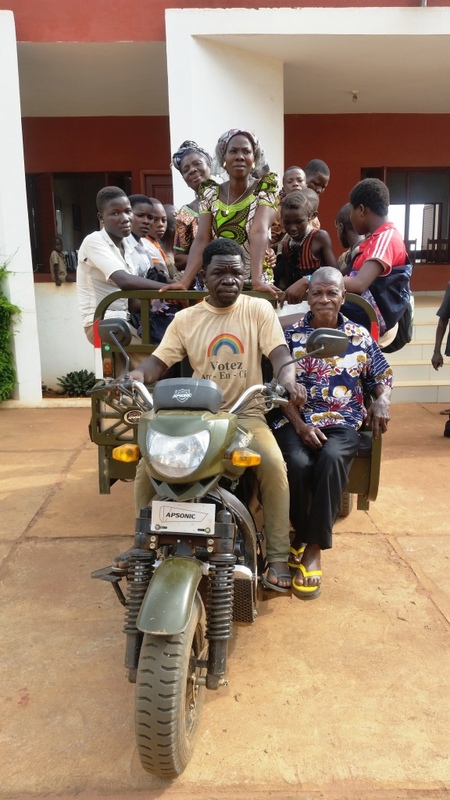 Pastor Sika in Togo – He requests special prayer as his family (especially his kids) are still having trouble coping with the recent nighttime attack by armed thieves at their home. Also Lucie was just hospitalized for emergency surgery for 4 days with unrelated health problems, and is now recovering, but they need to pay the hospital bill. But he also shares some good news – recently Pastor Sika took the JP staff and children to meet with the officials of the mining company nearby. They had to hire a special vehicle to transport them all, which can be seen in this photo. It must have been a memorable trip as they all sat in a makeshift trailer pulled by a motorcycle! It was a real experience for these kids who have rarely traveled outside of their village. They enjoyed a meal and were all given much-needed school supplies. 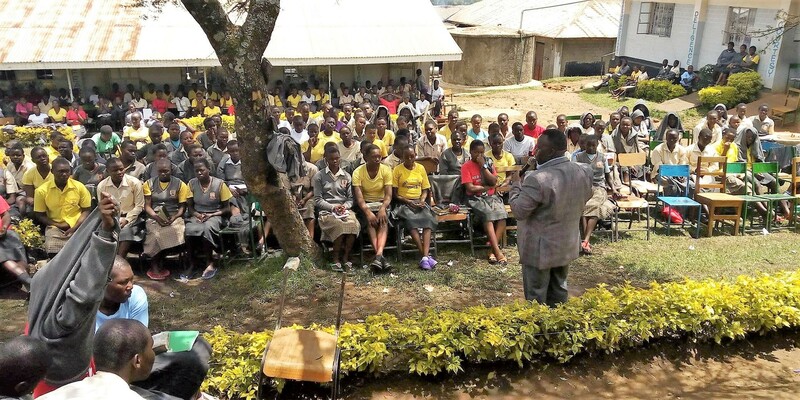 Mike in Kenya – He is currently in Nairobi attending a weeklong Sunday school teachers training, which is another door for connections to many churches around the country. Next week 20th to 25th he will be doing a children’s camp for the African Inland Church; and from 3rd to 5th December he’ll be doing a holiday club with a church in Nairobi plus training Sunday school teachers. Immediately after that he has the annual camp for the Kenyan Assemblies of God with literally hundreds of children. Every Sunday he helps run a teens meeting locally, and he is also planning a special two-day boys meeting at his local church bringing boys together just for Bible study. 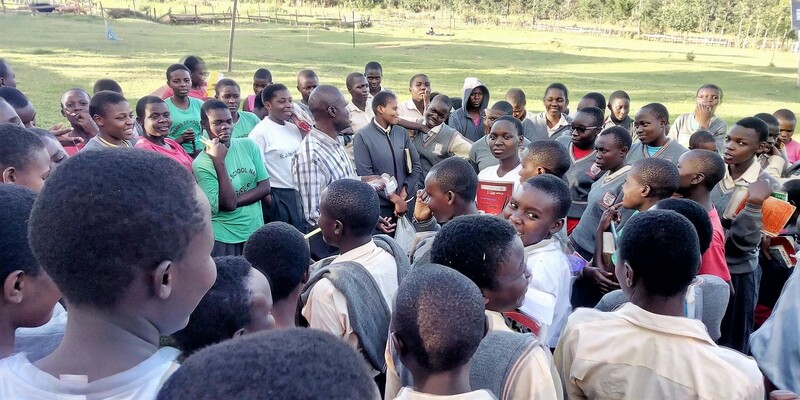 He continues to help with various visiting groups and his ministry in schools is in full swing as seen in these recent photos, where he finds lots of kids hungry for the Gospel. Please continue to pray for good health for him and his family – and strength to do it all! Honoré in C.A.R – In the past month God has really moved quickly to progress their vision at the CEERCA ministry site just north of the capital city. A longtime need was fulfilled when two guards were employed to provide security for the CEERCA site day and night – thus preventing theft and other problems. 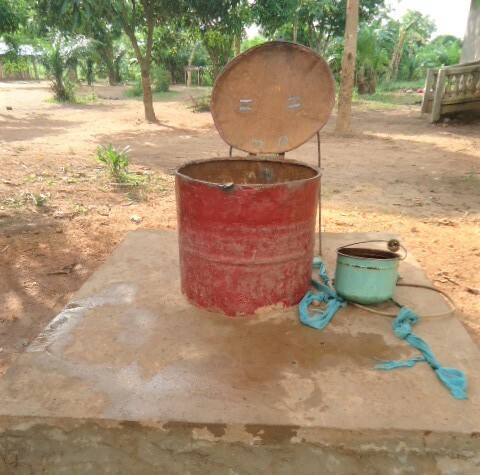 This simple fact also enabled the drilling of an all-important well on the site, providing much-needed drinking water to all at the church and also to local villagers. 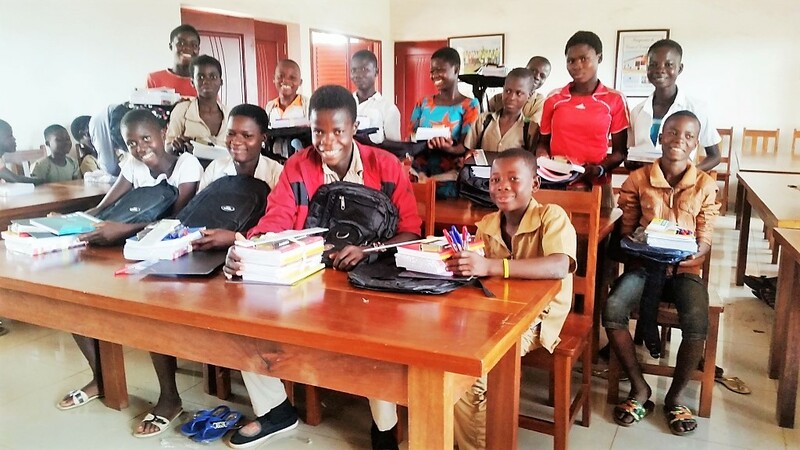 On October 15th, 2018, the CEERCA Bilingual School was officially inaugurated on the site and was attended by several government officials and even some UNICEF officials came to see it. It was an exciting day and was even reported by a local radio station and also a television station. It has been very well received by the people of the area, and Pastor Honoré and his team are now considered to be local community leaders. 200 children enrolled – many of the children are just in the first grades of schooling, but others are older and were never able to attend school regularly. English as well as French are taught and all the teachers are qualified and trained by the government. In addition there are special Bible teachers so that everyone can hear the Gospel and learn more of God. 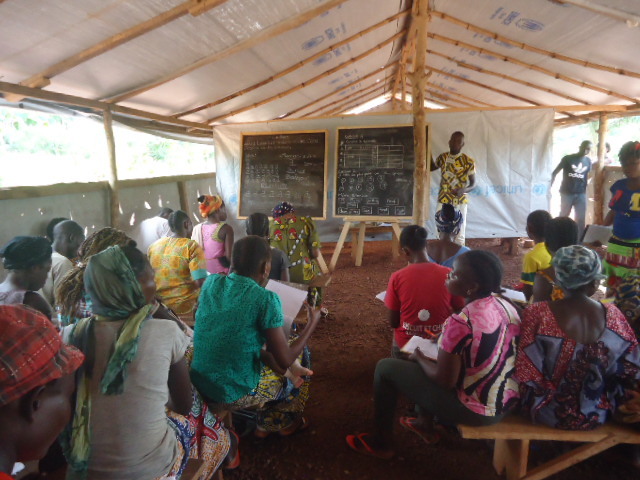 The school runs Monday-Friday and on weekends an adult literacy program has also begun to teach local men and women who are unable to read and write. Many are eager to learn as they want to read the Bible for themselves. 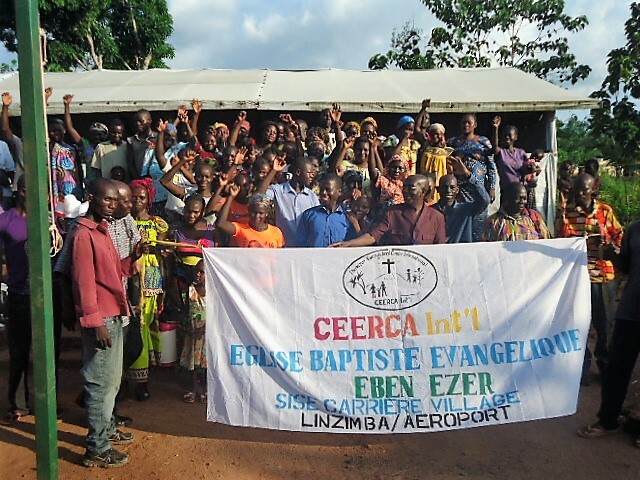 The CEERCA ministry site has truly become a gathering place for many to come to learn about Jesus Christ, and be able to advance in life, and is having quite an impact on the area! The church still needs permanent walls and a roof, but it just shows that the TRUE church is the PEOPLE!! A special donation of $1,000 from one of our partners was received to enable them to start a feeding program for the children who attend the school and church. This will include planting fruit trees and providing a small locked storage shed to store dry staples such as rice, beans and oil.